Sammie is Inspiring the World! Evansville Library - Evansville Library LED Sign - LED signs – outdoor and programmable, offer a wide variety of benefits when it comes to dynamic and affordable signage for businesses. Jasper Engines & Transmissions Channel Letter Sign - Channel letter signs light up your branding! Sign Crafters channel letters are a high visibility way to attract customers to your business - day or night. Goodwill® Dimensional Plastic Letters - Dimensional plastic letters can be formed or flat using several different types of plastic substrates and mounting methods. Steak & Shake Sign Installation - Among sign installation companies, Sign Crafters is recognized as a leader. We have built a reputation as the “go-to company” for sign installation! Metro Plastics Technologies - Their business logo was crafted with metal letters which can be produced for both inside and outside applications. Hanks' Market Channel Letter Sign - Sign Crafters offers a variety of channel letter styles. Channel letters with colored acrylic facing, lit with an economical LED light source is our most popular option. Sign Crafters, Inc. is a full service sign company known throughout the United States for our quality products, outstanding customer service and affordable pricing. We have earned a reputation among signage companies as experts in the manufacturing and installation of a wide variety of business signs. We understand the importance of displaying your brand’s logo and messaging through the highest quality signage available today. As a critical component of your marketing strategy, signs attract new customers to your business, as well as providing a highly visible, instantly recognizable representation of your brand to those who are already loyal customers. A sign from a quality sign company is the sure way to make a great first impression, and our clients count on signs from Sign Crafters to be manufactured consistently with precision and care. 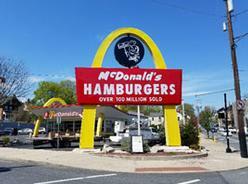 In the 1950’s we fabricated our first McDonald’s sign and are proud to say that they are still a customer. We understand the importance of quality in producing those iconic “golden arches” and apply the same high standards to every sign we make. We’ve been a leading U.S. sign company for over 50 years, providing our customers with signs to fit every location and need. From small businesses and community organizations to large national and regional accounts, we are dedicated to delivering the perfect sign for any application. The experienced and knowledgeable Sign Crafters team is available to work with customers on everything from custom graphic design through manufacturing and installation. Every business has unique signage needs, and Sign Crafters does it all. We’re pleased to offer everything from pylon signs to monument signs, marquee signs, metal letters, dimensional plastic letters, and more. Our commitment to remaining a front-runner among signage manufacturers includes incorporating the latest technology into our product offerings. 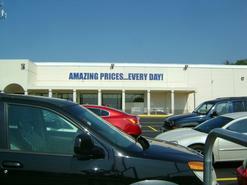 Our customers experience energy savings with LED signs and the convenience of programmable LED message units. As manufacturing processes and materials change with the times Sign Crafters maintains a state-of-the-art facility, allowing us to offer the most current signage options to our customers. Whatever type of business sign you’re looking for, Sign Crafters is the right sign company for you! From site survey and design to manufacturing and installation, our experienced team of professionals can do it all. We are proud of our past accomplishments and remain committed to quality products and services in the future. We invite you to find out more about everything Sign Crafters has to offer. Contact us today for more information on our custom business sign design, manufacturing and installation services.